Right, let's get the ear anatomy right to start with as its important. I'll explain why later. The bit you stick your finger in, or your lover their tongue, is the outer ear. The part where the Eustachian tube connects to and needs equalizing, is the middle ear. The inner ear has all the balancy-hearing bits (the semicircular canals and cochlea), nerves and stuff. So when a patient asks, can I dive with an ear infection? The answer is, it depends on which part of the ear. However, if it is the outer ear, there is a good chance you can dive. The reason for this is that it does not need equalizing, as it fills with water. The issue with outer infections is that they are bloody painful. So gnarly that you may not want to dive, but just lie in your room with a bit of deafness and raid the mini-bar to make you feel better. 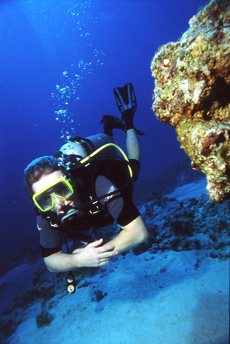 Most infections though set in on day three or four of a dive holiday. The constant in and out of the water, plankton blooms, warm water and pollution can lead to a bacteria soup in that part of your body which is nice and warm. A day later and there's this constant dull ache and often discharge, from the ear. You can diagnose an inner from a middle in the field by gently tugging on the ear lobe. Ouch! It's an outer. Hmm, and it's a middle. Treatment is easy... antibiotic drops for a while. Prevention is better... Swimear after every dive and you can use the antibiotic drops prophylactically at the end of the day. But if you can take the pain, it's the holiday of a lifetime and there's hammerheads down there, you can go for it. The Godfather of modern Psychiatry did more than just teach us that we all love our mothers in a bad way and that dreams actually mean something beyond lust. Yes indeedy, he and his family have henceforth been synonymous with rhyming slang for haemorrhoids. So thank you Sigmund, Clement and Emma. These little suckers have three different degrees of nastiness, and are quite literally a pain in the neck. They are a result of increased pressure where the deep venous system meets the superficial one. Imagine varicose veins, but in the jacksy. Grade 1's are small, internal and never come down. All they will do is cause a bit of bleeding on the loo. Grade 2's are up there but come down a lot. They have to be pushed back up. Wear a glove. Grade 3's are God's revenge for all MP's. They're out there all the time, will never go back in and you can't sit down for a few minutes without having to pop up on your feet pretending to ask the Prime Minister a question. 3's can get really big too. Normally grapes are the synonymous fruit. But I have seen oranges and once a small melon. Hence the doughnut shaped sitting ring for those awaiting surgery. Treatment is surgery for most, or sometimes injection for the smaller ones. There is also the super-tight elastic band around the neck of them that causes gangrene and they drop off too. Though there's no guarantee when they will fall off, so check your diary that you have no public speaking functions in the next few days after a "Baron's Ringing"– as it's known. Can you dive with piles? And I get asked this a lot by divers. Grade's 1 and 2. Yes. 3 and I would be worried about the chafing on the wetsuit, or a dry suit squeeze right onto the evil things. So in this case, turn your wetsuit into a circle, sit on it for the 9 months it takes to get an op, and blame whichever Minister of Health is cocking up the NHS this month.